The peaks of Snowdonia rise before you encased in mist, their summits barely visible. The highest is Snowdon (Wyddfa) herself at 1,085 metres. The year is 1894, and the Snowdon Mountain Tramroad and Hotels Company Limited has been formed to build a branch line from Llanberis to the summit. You can scarcely believe it's possible! 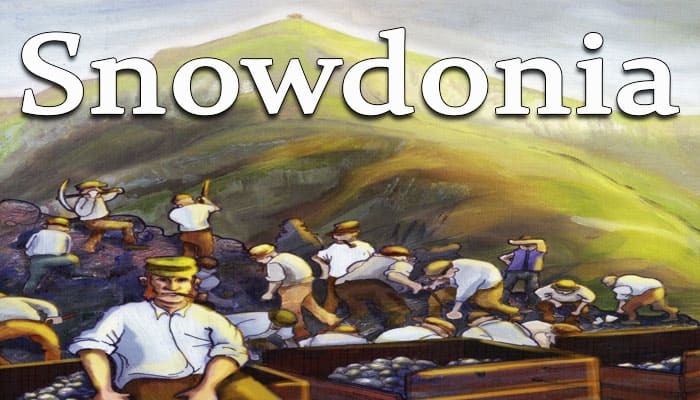 In Snowdonia, players represent companies providing labour for the construction of the Snowdon Mountain Railway. Unlike other train games you will have to excavate your way up the mountain-side, as well as make and lay track, construct viaducts and stations. All this in competition with the weather of the Welsh mountains and your fellow players. You'll be assisted by a train and can collect essential materials from the Stock Yard. You will obtain special work contracts that give you bonus points at the end of the game. Each turn a player allocates labourers to specific tasks, such as getting supplies, excavating the mountain, making or laying track, building parts of stations or obtaining lucrative contracts. A player uses supplies to construct sections of the railway that will yield victory points once the route has been completed. Players can also buy trains to ship in extra labourers and to improve their work rate. A player who completes contracts for specific work will gain bonuses at the end of the game. Place the game board in the centre of the table, so that all players can reach it. Randomly determine who will be first to play and give that player the Start Player Marker. Players take all the pieces of their color. The 16 x Ownership cubes per player is a fixed limit. If these run out, the player cannot take ownership of any more Track cards or Building sites. Each player puts their Surveyor in any empty space on Llanberis. Each player puts two of their Labourers into their personal supply for use in the first turn, leaving the remaining Labourer in the Pub. For the Snowdon game use the yellow side of the Station cards; the blue side is for the Blaenau Ffestiniog game. Sort them into numerical order by the number on their top right hand corners. Waterfall Station (2) is not used if playing solo or with 2 players. The Passing Loop (4%) is only used with 5 players. Starting at Llanberis (printed on the board) and going clockwise round the board, lay out the Station cards in numerical order with spaces between them, so they go from Two Viaducts (1) to Yr Wyddfa (7). Shuffle the Track cards. The number of Track cards between each Station card is printed on each Station card's top left hand corner. Place randomly drawn Track cards, shovel side up, between the Station cards adjusting them, so that the Track and Station cards are evenly spaced. Place rubble on each Track card equal to the number on the card, and also put the indicated number of rubble pieces on the Station cards in the boxes marked with a shovel. The game board has the action spaces for a 3 player game printed at the top in seven Action Areas marked A to G. If you are playing solo, or with 2, 4 or 5 players, take the alternative action space cards and place them over the Action Areas printed on the board, so that the number at the top of each Action Area matches the number of players. Put a Game marker on each of the 2 dots on the Work Rate tracks. Put the other 6 Game markers with the general supply of pieces off the board. If playing solo or with 2 players, remove the two Contract cards marked '3-5' (28 and 29) from the deck. Shuffle the Contract cards and place them in a pile face down on the board. Take the top three Contract cards and put them face- down, one per space, on the numbered spaces at the bottom right of the board; these spaces form the Site Office. Take a Weather disc of the same color as the weather icon on the back of the middle Contract card and put it into middle space of the Weather Track; then repeat for the right-most card putting the Weather disc into the lowest space of the Weather Track. Turn the three Contract cards face-up. In the 2 to 5 player game shuffle the Train cards and place six Trains, selected randomly, below the game board to form the Engine Shed. Set aside the remaining Train card for now - it will not be available as a train in this game. Put Coal from general supply onto each Train as indicated on the card. Put 7 Iron Ore, 4 Stone and 1 Coal on to their spaces in the Stock Yard. Put the number of Iron Ore, Stone and Coal into the Supply Bag as indicated in the Supply Table. All other Iron Ore and Stone should be put back in the game box; they will not be needed in this game. Put all remaining pieces into a general supply area. Contract cards have effects printed on the middle part of card that modify the action you are taking or change the rules in your favour. They also have a scoring bonus on the top part that is used at the end of the game. Before the first action is resolved for an Action Area, players may play Contract cards. In clockwise order beginning with the Start Player, each player may play one or more Contract cards that have the current Action Area shown at the bottom left of the card. When a Contract card has been played, turn it sideways to show that its effect has been used and leave the card in the player's area. Card effects persist until the end of the current round. Take 3 Iron Ore and/or Stone from those available in the Stock Yard into personal supply. Alternatively, take one Coal and two Iron Ore and/or Stone. If a Labourer is in the last space of the Stock Yard, the owning player additionally becomes the Start Player; that player takes the Start Player Marker. If no-one occupies this space, the Start Player Marker remains with the current Start Player. Take up to three cubes into your personal supply. Note: Hoarding will keep the bag emptier and cause more Events to occur! This may be part of your plan, or it may be your undoing! The current Excavation Work Rate is shown by the Excavation Work Rate marker. Take the number of Rubble cubes equal to the current Excavation Work Rate, including any bonuses from an owned Train and/or a played Contract card, from Track and/or Station cards into personal supply. A player with a Labourer on an Excavation action space must take the full number of Rubble cubes up to the current Excavation work rate plus any bonuses and cannot choose to take fewer, unless there is no Rubble left to excavate. The Track card with remaining Rubble closest up the mountain to Llanberis. If all Rubble has been removed from Track cards leading up to a Station card, then take Rubble from the leftmost excavation site on the Station card. The player who takes the last Rubble cube from an excavation site on a Station card will gain the victory points for the site at the end of the game. Put one of that player's Ownership markers on the excavation site. If there isn't enough Rubble left on the whole route for your action, take as many cubes as there are available. At the end of the round in which there are no more Rubble to excavate from any Track and Station cards, take the Train card set aside at the start and place it on the Excavate Action Area with the B Build Action Area uppermost. This card now replaces the Excavate Action Area and provides an extra Build action space in position B of the Action Area sequence. When all rubble has been excavated, an extra Build Action Area becomes available. 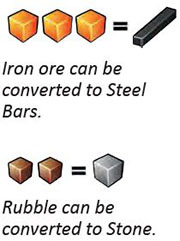 Convert 3 Iron Ore into 1 Steel Bar, or change 2 Rubble into 1 Stone. Do this up to three times per action space. You may mix these trades if you choose, for example gain 2 Steel Bars and 1 Stone, or 2 Stone and 1 Steel Bar, and so on. Take Steel Bars from general supply and Stone from the Supply Bag; if the bag runs out, players cannot make more Stone until some is returned to the bag. Put the Iron Ore back into the Supply Bag and the Rubble into general supply. 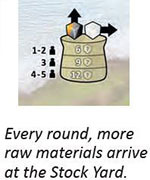 Players are not allowed to look in the Supply Bag prior to converting Rubble to Stone. 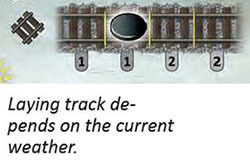 The current Lay Track Work Rate is shown by the Lay Track Work Rate marker. Return to general supply a number of Steel Bars up to the current Lay Track Work Rate plus any bonuses and, for each one, turn over the fully-excavated Track card closest up the mountain to Llanberis. Place one of the player's Ownership markers on the Track card to show which player laid the track. A player with a Labourer on a Lay Track action space cannot choose to lay track at less than the current Work Rate plus bonuses, unless the player has insufficient Steel Bars, or there are not enough excavated Track cards, or there is no more track to lay. If there are not enough excavated Track cards to complete the action, the player must complete as many as possible. Reminder: When ALL track is laid, the game will finish (at the end of the round). After all Track cards leading up to a Station card have been excavated, each Labourer on a Build action space can build any one non-excavation site of that Station. Pay the resources specified on the non-excavation site of your choice by putting them in the bag, if they are Stone or Iron Ore, or to general supply if they are Steel Bars, and place one of the owning player's markers in the site space. Players must pay the full cost of the site, as non-excavation sites cannot be partially fulfilled. Note: Players cannot complete parts of a Station until all Track cards up to that Station card have been excavated. However, the excavation spaces on the Station card do not need to be cleared; they represent the track continuing past the Station up the mountain. Alternatively a player can use this action to obtain a train card from the remaining available Trains, after the "Trains may now be bought" event has happened (see Resolving Events). The owning player takes one of the remaining Train cards and any Coal on it and pays the number of Steel Bars stated on the Train card to general supply. Note: Trade in Steel Bars or Stone to build parts of the Stations for victory points or Trade in Steel Bars to build a Train. Take a card of the player's choice to hand from the three face-up Contract cards in the Site Office. Put the card face up in the player's playing area (until it is played and turned sideways, it counts as "in your hand"), so that other players can read it. Move the player's Surveyor on to the next Station card numerically along the route. Whether Rubble has been excavated or track laid is irrelevant to the Surveyor. Note: The Surveyor is not just a default pass' action! Send your surveyor further up the mountain for more points at the end of the game. Repeat Rounds until the End of Game is reached. 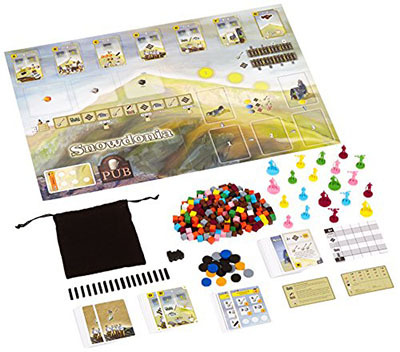 In clockwise order beginning with the Start Player, each player places one of their Labourers from their personal supply onto any of the numbered action spaces in any of the Action Areas on the game board ( A through Q). Continue to place Labourers, one piece per player at a time, until all players have placed all of their Labourers in personal supply. Before placing their first Labourer, each player with a Train may return one Coal (two Coal for Train No. 6) from personal stock to the Supply Bag to take the temporary Labourer in their color from the Pub and put it into their personal supply. The temporary Labourer can be assigned to actions just like any other Labourer. An extra Labourer for the round can be bought with coal if you have a train. Action Areas are resolved in order A through Q . Within each Action Area resolve the actions in numerical order one-by-one from space . If a player has a Labourer on an action space, that player must carry out that action; taking actions is not optional. If a player has two or more Labourers within a single Action Area, that player must carry out the action once for each Labourer. After completing actions, return Labourers to each player's personal supply, except that temporary Labourers (a player's third Labourer) are returned to the Pub when used. If a Contract card is in position  in the Site Office, put it face down onto the discard pile. Move any other Contract cards in the Site Office to the left to close up any gaps. Add cards face up to the end of the line from the top of the Contract Card Deck, until the Site Office spaces have one each. Move the Weather discs one space along to the left. The disc furthest to the left (with the "!" on it) shows the current weather. Look at the top (unrevealed) card of the Contract Card Deck, take a Weather disc in a color matching the weather icon on the back of that card and place it in the lowest position on the Weather Track. 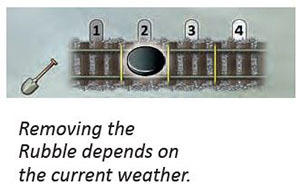 Adjust the markers on the Excavations and Lay Track Work Rate Tracks according to the current weather, referring to the Weather Key below the Weather Track. Don't go off either end of the tracks! Fog = No Excavation [B] or Lay Track [D] actions can be performed this round. Leave the Work Rate markers as they are, but put a Fog disc on both those Action Areas to show that Labourers cannot be placed there. Note: The Work Rate markers show how much Rubble can be excavated or track laid by each Labourer assigned to one of those actions. When the weather has been resolved, put the marker in the current weather space back in general supply. Sun improves performance, Rain decreases performance, Fog stops certain things being done at all. The number of cubes required for restocking varies according to the number of players and is shown on the board to the left of the Event Track. Take the appropriate number of cubes at random from the Supply Bag and place them on the Stock Yard spaces according to the cube type, Iron Ore, Stone or Coal. If any Event cubes have been drawn, put them on the Events Track, one cube per space, starting immediately after the last occupied space; as you place each Event cube, resolve the Event immediately before placing any more Event cubes. Be aware of the Event track and \ how empty the resource ba9 is! Might there be a chance of a couple of Event cubes coming out and messing up your plans? The game ends at the end of the round when the last Track card in the route - the one next to Yr Wyddfa - has had track laid on it. In the Solo and 2 player versions, if the last Track card in the route has not yet been placed, the game ends immediately after the last Ownership marker is placed (number 16 or number 32 respectively). Beginning with the Start Player each player scores victory points as follows. Use a page of the Score Pad to record the scores. When counting up Rubble cubes and Ownership markers to score bonuses, you cannot score more than one Contract card with the given resources; for example, if you have laid 4 tracks and have a '4 track' and a '3 track' Contract card, you can only score one or the other, not both. Add the victory points for each excavation and non-excavation Building site on which the player has an Ownership marker. Don't remove the Ownership markers yet; these are used for scoring Contract card bonuses. Add the victory points on each Track card on which the player has an Ownership marker. Don't remove the Ownership markers yet; these are used for scoring Contract card bonuses. Players score bonus points for all Contract cards they have in their playing area, regardless of whether or not their effect has been used. The end game scoring section is the top part of the card. Excavate bonuses: put the indicated number of rubble pieces from personal supply on to the card and gain the stated victory points. If the player cannot pay that many rubble pieces, leave them where they are, and the card scores nothing. 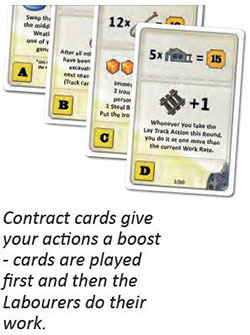 track bonuses: move the indicated number of that player's Ownership markers from completed Track cards onto the Contract card and gain the stated victory points. If the player cannot move enough markers, leave them where they are and the card scores nothing. Track and Excavate bonuses: put the indicated number of rubble pieces on to the card and retrieve the indicated number of completed Track Ownership markers to score the stated victory points. If the player cannot complete all the conditions, leave rubble and markers where they are and the card scores nothing. 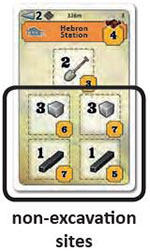 Track, Excavate and Building bonuses: put the indicated number of rubble pieces on to the card, retrieve the indicated number of Ownership markers from completed excavation and/or non-excavation building sites and Track to score the stated victory points. If the player cannot complete all the conditions, leave rubble and markers where they are and the card scores nothing. Building bonuses: move the indicated number of that player's Ownership markers from completed excavation and/or non-excavation building sites and gain the victory points on the card. If the player cannot remove enough markers, leave them where they are and the card scores nothing. Surveyor bonuses: If the player's Surveyor has reached at least as far as the indicated station, the player scores the stated victory points. Otherwise the player does not score the bonus on the card. The player's Surveyor still scores the victory points on the Station card reached by the Surveyor. Coal bonus Contract card (27): If the player has this Contract card, score 2 victory points per Coal cube in your personal stock. If the player has No. 4 Snowdon, add 9 victory points to that player's total. 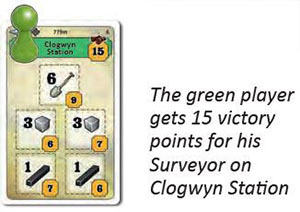 Add the victory points printed at the top right of the Station card reached by the players' Surveyor. The player with the most victory points is the winner. If there is a tie, then all tied players win.